About a year and a half ago I saw an advertisement in JC Penney for a set of blocks that spelled out Merry Christmas. Cute holiday decor that got me thinking . . .
At the time I thought I could make something similar but each side of the blocks would have a different Christmas phrase spelled out like "Feliz Navidad" and more. As I thought about the project more, it occured to me that "Merry Christmas" has the same amount of letters as "Happy Halloween" and "Happy 4th of July." 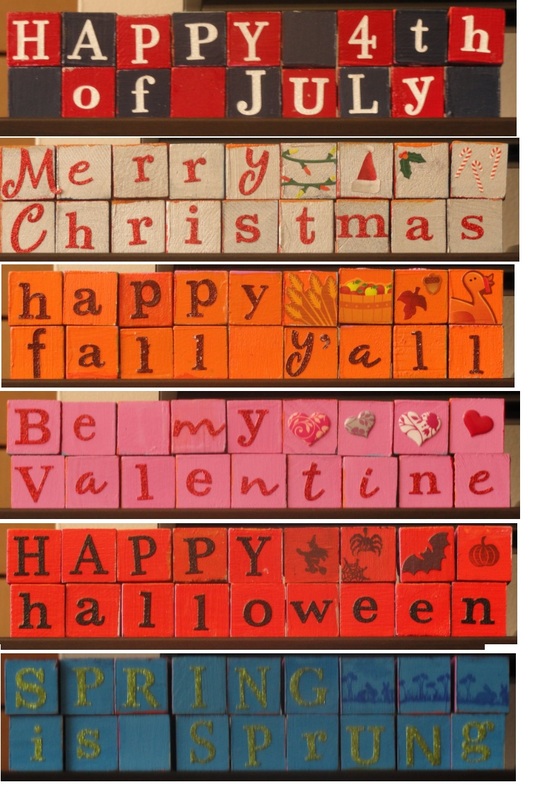 Hmm. . . .
What about a set of blocks that adapted to whatever holiday was coming up next? Each side with a different color scheme and lettering applicable to the holiday on hand. Plus it cuts down on storage needs when you have 6 decor pieces in one! My constantly growing collection of holiday storage totes thank me for the idea. I picked up the value packs of 1" blocks from Michaels which were perfect for my needs - although they seemed a bit on the small side at first, knowing that I would have at least 9 blocks in a row to spell out words like "Christmas," the one-inchers suddenly looked like they could take up a lot of room on the mantlepiece. My back up plan had I not found this value pack was to go to Home Depot and cut wood to size. Slowly but surely, all of the sides got painted. When it came to lettering, I scoured Michaels and really only found one set of letter stickers that seemed to be the perfect size: not too big, not too small, not too 3D (as they had to sit flush against the other blocks no matter which side they were on). I picked up packs in red, white, green and black - thank goodness for the 20% off entire purchase coupon! For the fall-themed phrase, I wanted to have a darker font color, but not black so I tested out painting some of the letters. What do you know, it worked out perfectly! Careful application of letters, sourcing of extra stickers and stamps for the extra spaces blocks and a layer of mod podge later and voila! The camera seems to pick up every paint imperfection, so I swear these don't look as rough in person. However, in some cases the blocks look a little vintage-y when they are slightly off. This is most noticable in the orange blocks for Halloween where I messed up a stamp and had to paint over black ink. Then I messed it up again and had to paint over even more black ink. Wah wah. The effect I alluded to earlier is one of my favorite parts of the project: since each block is in the right order no matter which side is facing front, the alternative sides spell out the other phrases. The back of this one says "happy fall y'all" albeit upside down. I'm planning on finding an appropriate sized display box so that you don't always have to see the sides and the tops (it could get distracting to see a red and silver "Merry" amongst spooky Halloween decor). In the meantime, here is the rundown of all six sides. ﻿I'm rocking a belated Happy 4th of July right now as fall is a little ways off! These turned out great Lydia! When my mom and I go to craft shows I always oogle at the message block that people are selling. You did a great job with yours, and I think they look better and are mor functional than so many I have seen! Thanks Beth! They were fun to make!